Learn how and when to use thick yoyo lube to keep your yoyos playing easy and responsive. Using Thick Yoyo Lube for Responsive Yoyos Yoyo TrickIn this video I am going to talk about using thick yoyo lube to help your yoyos play better. We also have another video about using thin yoyo lube that you can check out, that’s for mostly unresponsive yoyos thick lube is more for beginner yoyos and yoyos that you want to play more responsive, so we will talk about that. At the end of this video I’m also going to show you an example of how to use the lube. So what thick lube is for, is when you got a yoyo and it used to come back really easy, but then eventually over time it seems like it doesn’t come back the way that it used to. It starts to play a little bit inconsistent, and it gets really frustrating. Even though you’re getting better as a player the yoyo seems to be getting worse. Well most likely what’s happened, is you got a yoyo that has a bearing or a transaxle, and that came lubed and now the lube has started to wear out. So the way to solve this problem, to get the yoyo to play consistently again and easily like it used to, is to just just add a little bit of thick yoyo lube. Now the reason why there is yoyo specific lube as opposed to any lube you might have around the house, you know like wd-40, or motor oil, or skateboard grease or something, is that all those different lubes have a specific purpose and they aren’t always going to work exactly right in a yoyo. Some of them are going to be little bit too thick and so they are going to kill the spin on your yoyo. 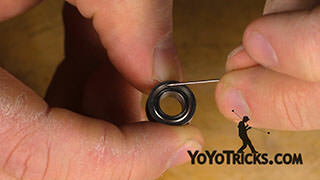 Some of them are going to be too thin and so they won’t make the yoyo play as responsive or as easy as you’d want. 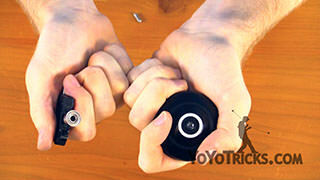 Some of them are designed just for metal, so it could actually damage the plastic of your yoyo. I’ve heard stories of yoyos breaking in half after using the wrong kind of lube for too long. So there’s all kinds of problems you can have. Thick yoyo lube is formulated to work perfectly in all those different scenarios and it’s going to make your yoyo play better. So let’s get to it, as you can see we’ve got our Sage yoyo which is set up for responsive play and of course our YoYoTricks.com Thick Yoyo Lube. Something that is especially nice about our lube is, as you can see, it’s got a fine applicator tip, which makes it a lot easier to get the lube where you want it to go as opposed to spilling it all over the place. You’ll appreciate that if you end up getting it. So of course the first thing you will need to do is get your yoyo apart and you’re going to want to get the string out of the way. In most cases it is a lot easier to lube the yoyo properly if you remove the bearing, I am just going to use a mutlitool right here which works for any yoyo with a size C bearing and it comes off pretty easy. You’ll see why because what I’m going to actually do is I am going to put lube onto the yoyo itself instead of in the bearing. Even though that is kind of counter intuitive, it actually makes the yoyo more responsive and more consistent then just lubing the bearing and it actually helps the yoyo even sleep longer than if all you do lube the bearing. So it seems to be a good deal all the way around. 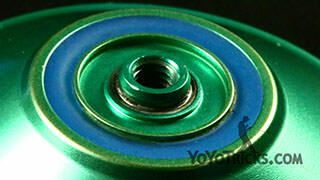 Where you want to put the lube is wherever the bearing is going to touch the yoyo. So this one has a bearing seat, see this, put a drop or two of lube just right on top and if you want to you can put it on both sides, but it will make its way around. Put a little drop here, a drop there. Now with other yoyos, they are not always going to be set up the same way. So with some yoyos, instead of having a bearing seat built right into the plastic they’ll be spacers and the bearing will sit right on the spacer, so in that case you will want to lube the spacer. Some of them have a bolt that goes all the way through and the bearing actually sits right on the bolt so in that case you lube the bolt right where the bearing goes, put the bearing on, or lube the other side of the bolt as well. So that’s pretty much it. If you want to take a look, you can kind of see how much I got on there. It’s pooling a little bit but it’s not a ton and yet it’s not too little. Eventually as you work it out you will figure out the right amount for yourself. After I would just put the bearing back on. Now after I’ll put the yoyo back together and then give it a test and see how well it works. If it didn’t play as responsive as I’d like, then I would put some lube in the bearing. It’s the same type of situation, where I would usually put one drop in one place if I want it to be more responsive you put another drop in or you can even put in three drops. If you put too much lube in as you play with it, that’ll will thin out so it’s not really a big deal. If you got a yoyo with a smaller bearing that will not take as much lube, but everything just comes through experimentation. Now one thing is some yoyos, and this is true more true of yoyos with small bearings or something like the Oracle, is every time you lube it and then you put the string on and you play with it and you lube it again eventually over time the lube is going to build up in there and it’s going to slow the bearing down so that it doesn’t spin quite as well. So what you can actually do is take some of our thin lube and put that in the bearing and that will allow it to kind of spin free and that will basically allow you to reset the bearing without having to clean it. Once you run some thin lube through it then you can put some thick lube back in and you’ll see that it plays great again. Again, you know, just put the yoyo back together and you are pretty much all set. So that is how you use YoyoTricks.com Thick Lube to make your yoyo play better. So as you can see I got our Sage and we’ve got our thick yoyo lube in it. You remember before when I was trying to pull it up it was kind of inconsistent and you didn’t know what to expect. Now you can see that even with just the slightest tug the yoyo is coming back. 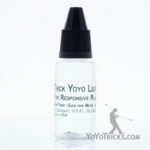 That is going to help deal with a lot of frustration, especially if you want your yoyo to play responsive. Now one thing that might happen with thick yoyo lube is if you put a lot in the bearing when you are first starting to play with your yoyo, it might not spin as long as it did before. Don’t worry about that, as you play with the yoyo, in two, three, four minutes, that lube will kind of break in a little bit and your yoyo will spin just as long as it did before. Those are just some of the advantages of using thick yoyo lube on your responsive yoyo.